QUIZ: What kind of college hoops fan are you? 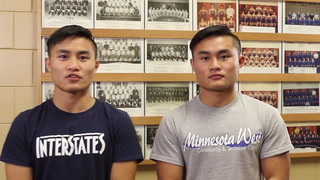 This week's episode features Hser Eh and Hser Moo Pwae, who both wrestle for Minnesota West. MOORHEAD -- Running on a flat course Saturday on the grounds of the Southside Regional Soccer Complex, three former area high school cross country runners participated as college freshman at the Northern Sun Intercollegiate Conference (NSIC) meet. A trio of area high school cross country runners, now running in college, helped their respective programs cruise to team titles Saturday (Sept.
WORTHINGTON -- Too many years have passed to allow Jason Reitmeier to compete now in an actual wrestling match, but time has not diminished his heroic status in the minds of longtime Worthington area fans.